*Three B-2 stealth bombers flying non-stop from the United States have dropped 40 bombs on a major Libyan airfield tonight in an attempt to destroy much of Libyan leader Muammar Qaddafi's air force, CBS News David Martin reports. At the same time, US Air Force fighter jets conducted missions searching for Libyan ground forces to attack. No US aircraft were lost during the missions. Libyan state TV is reporting that air strikes have killed 48 people and wounded 150 in "civilian areas." Libyan state TV is controlled by Muammar Qaddafi's government and it was impossible to confirm the reports of civilian deaths Saturday. * A state department spokesman said no U.S officials remain in Libya. The state department has also advised all Americans in Libya to leave, and for everyone, even journalists, to avoid travel there. * Al Jazeera reports that Libya has decided to suspend co-operation with Europe in the fight against illegal immigration, state TV citing a security official reported on Sunday. * Several news outlets are reporting heavy and sustained anti-aircraft fire in Libya's capital, Tripoli, perhaps signaling the start of the second-wave of coalition action there. * Qaddafi sent two letters today to the coalition partners currently launching strikes inside his country. One was to President Barack Obama, the other to the leaders of France, England and the United Nations. Notice the dramatically different tone between the letters below in translations by the Associated Press. "To our son, the honorable Barack Hussein Obama: As I have said before, even if, God forbid, there were a war between Libya and America, you would remain my son and I would still love you. I do not want to change the image I have of you. All of the Libyan people are with me, ready to die, even the women and children. We are fighting nothing other than al-Qaida in what they call the Islamic Maghreb. It's an armed group that is fighting from Libya to Mauritania and through Algeria and Mali. ... If you had found them taking over American cities by the force of arms, tell me what you would do?" "To French President Nicolas Sarkozy, British Prime Minister David Cameron and U.S. Secretary-General Ban Ki-Moon: Libya is not yours. Libya is for the Libyans. The Security Council resolution is invalid because it does not follow the charter regarding the internal affairs of any country. This is terrible oppression, crude aggression. You never have the right to intervene in our internal affairs. Who gave you this right? You will regret it if you dare to intervene in our country. Our country is not your country. We cannot fire a single bullet at our people." * Embattled Libyan leader Muammar Qaddafi released a statementSaturday, warning that international air and missile strikes inside his country have turned North Africa and the Mediterranean Sea into a "real war zone." Qaddafi said: "The interests of the involved countries will be subjected to threats as of now in the Mediterranean Sea because of this aggressive, foolish act that's completely unjustifiable, other than it is a mere crusader colonial aggression that aims to launch a second wide ranging crusader campaign." * (AP) A Libyan journalist who ran a webcast program showing the aftermath of government attacks and commentary on the uprising against Muammar Qaddafi was killed in Saturday's government assault on the rebel capital in the country's east. Mohammed al-Nabbous, who founded a livestream channel called Libya Al-Hurra, or Free Libya, was hit by sniper fire as Qaddafi sent warplanes, tanks and troops into Benghazi, the first city to fall to the rebellion that began Feb. 15, friends said. * A day after it was announced that Libya would free four detained New York Times journalists, satellite newscaster Al Jazeera said four of its employees had been detained there. In a statement the network said: "Lotfi al-Messaoudi (a Tunisian), Ahmed Vall Ould Addin (a Mauritanian), Ammar al-Hamdan (a Norwegian cameraman) and Kamel Atalua (British) were held while working in the west of the country. Al Jazeera says that the Libyan authorities will be held accountable for the safety, security and well-being of the team, who are being held in Tripoli." * United Nations Secretary General Ban Ki-Moon said Saturday he received an urgent call from the Libyan Prime Minister, telling him that Libya will strictly abide by Resolution 1973, authorizing a no-fly zone and enforced ceasefire in Libya. Ban described the caller as sounding "rather desperate," reports CBS News foreign affairs analyst Pamela Falk. "He asked me to intervene to stop military action on the part of the international community," Ban said. * So far, the United States, France, the United Kingdom, Italy, Spain and Norway are the announced partners in the international coalition taking military action against Qaddafi's forces. Here is a complete breakdown of what hardware they have amassed for the operation thus far. * A senior military official tells CBS News that most of the targets for the initial strikes are around Tripoli and Misrata. One target is as far west as Zawiyah, another as far east as Surt, nothing around Benghazi. They're going after the nodes that link the air defense sites together. The U.S. will have 5 Navy electronic aircraft, three submarines, and two destroyers, all armed with cruise missiles. The U.S. will also has 3 supply ships and 2 amphibious ships positioned off Libya. There will also be one Canadian, three Italian, one British and one French ship off the coast plus six more Italian ships outside the immediate attack zone. Enforcing an arms embargo is part of this operation, in addition to military strikes. The no-fly zone will cover virtually the entire coast of Italy from Tunis on the east to Egypt on the west. It goes as far south as Sabha. If you were to draw a triangle from those three points that would be a rough approximation of what it looks like. * President Barack Obama said in a statement regarding Libya: "We can't stand idly by when a tyrant tells his people there will be no mercy. (In the military action there), we are part of a broad coalition. We are acting in the interests of the United States and the world." Read the story on Obama's statements here. * The Pentagon says the U.S. has launched a missile strike on Libyan air defenses. A U.S. military official says the strike was aimed at air defense sites along the Libyan coast. * (Al Jazeera) Sources tell the Al Jazeera channel that French fighter jets destroyed four Libyan tanks in southwestern Benghazi. * (CBS) Defense Secretary Robert Gates has postponed for one day his planned trip to Moscow. He was scheduled to arrive Saturday. * (Al Arabiya) Russia's foreign ministry expressed regret over the decision by Western nations to undertake military operations in Libya. * (CBS) The Paris Summit for the Support of the Libyan People issued a declaration today describing the situation in Libya as "intolerable," and stating that the coalition was "determined to act collectively and resolutely" to support the U.N. Security Council resolution 1973. The summit paid tribute to the Libyan people, especially the Libyan National Transition Council and others who have disassociated themselves from the Qaddafi regime, and promised to be at their side "to help them realise their aspirations and build their future and institutions within a democratic framework." "Our commitment is for the long term: We will not let Colonel Gaddafi and his regime go on defying the will of the international community and scorning that of his people." While the Summit maintained that it would use military action to ensure compliance with the U.N. resolution, it also noted that UNSC 1973 does not allow for any occupation of, or attempt to occupy the Libyan territory." * (CBS) As the Obama administration responds to the Libyan conflict, one thing appears to be certain: they don't want to appear to be in charge. Writing for Political Hotsheet, Robert Hendin says U.S. President Barack Obama and Secretary of State Hillary Clinton have both reiterated that American troops will not be on the ground in Libya, and that the United States is taking a supporting role in operations being led by France, Britain and others. With U.S. troops currently engaged in two wars in Muslim countries - Afghanistan and Iraq - it's clear, Hendin writes, that the U.S. doesn't want to be seen as leading a third. 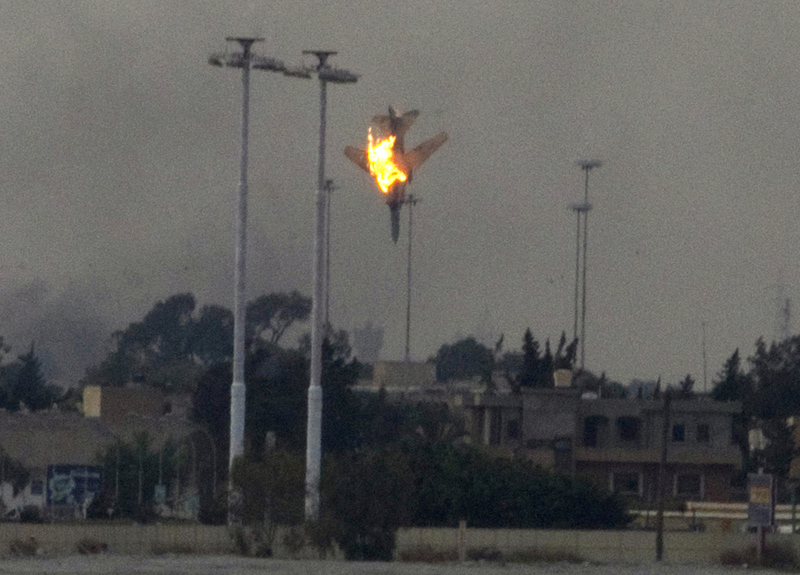 * AP: French defense official says French fighter jet has fired on Libyan military vehicle. * Speaking in Brazil on the first day of a three-country Latin American tour, President Obama said that the U.S. and its allies are prepared to act with urgency to end violence against civilians in Libya. Obama: "The people of Libya must be protected"
"Our consensus was strong, and our resolve is clear. The people of Libya must be protected, and in the absence of an immediate end to the violence against civilians our coalition is prepared to act, and to act with urgency," Mr. Obama said. * CBS News' David Martin reports a U.S. military source has confirmed that French planes have overflown Benghazi. Martin reports they were likely to have been reconnaissance flights, intended to photograph the disposition of pro-Qaddafi forces on the ground ahead of strikes expected later today. * Speaking from urgent talks in Paris, President Nicolas Sarkozy says France has already taken action against Libya. * Al-Jazeera is reporting that French planes are prepared to begin bombardment of pro-Gadhafi forces around Benghazi in order to send a message that they are breaking the siege. * The western Libyan city of Zentan is under heavy bombing from government forces. * French reconnaissance planes have been flying over Libya, according to Reuters. While the talks in Paris are ongoing, a French military source says, "There are French reconnaissance aircraft over Libya." * A warplane was shot down over the eastern Libyan rebel stronghold of Benghazi on Saturday, though it is unclear whether the jet belonged to Qaddafi's forces or to the rebels. * Leaders from the Arab world, Africa, the United States and other Western powers are holding urgent talks in Paris Saturday over possible military action against Libyan leader Muammar Gadhafi's forces.